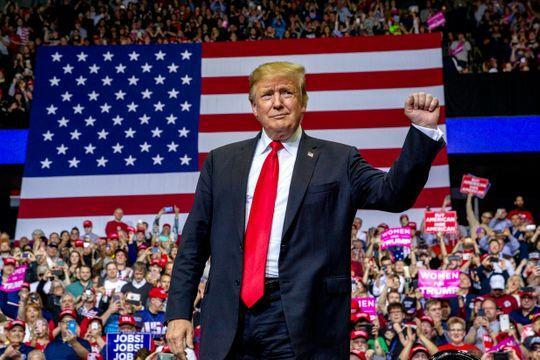 Approximately 34% of attendees at President Trump's Thursday night rally in Grand Rapids, Michigan were registered Democrats, according to Trump's 2020 campaign manager Brad Parscale. Speaking on Saturday with Fox News' Jesse Watters, Parscale explained that the campaign uses the phone numbers of attendees to look up their voter information. "We had tens of thousands of registrants, I believe 34% of the people who came to the Michigan rally were Democrats," said Parscale, adding "Almost half had only voted once in the last four elections." When asked if the campaign was still harvesting information on various demographics, Parscale said: "I'm harvesting nearly a million voters data information in key swing states every month." "That must terrify the Democrats," interjected Watters. "Yeah, we are - put it this way, we are four times ahead of where we were in 2016 and I plan on being 6 to 8 times ahead in data, that's tens of millions of records."